If you’re like me, coffee is something you take seriously. Espresso is your #1 go-to, and you never settle for second rate. In fact, for dedicated espresso drinkers like us, regular brew seems a travesty against the entire institution of coffee! The problem for coffee connoisseurs like us is that we end up spending half of our yearly salary at places like Starbuck’s and Peet’s. Instead, we could be saving a bundle by getting our own machine. “Don’t the good espresso machines cost a fortune?” you ask. I know I did. The good news is, not anymore! You can now get a great machine in the $200 range. Sure, you may not get all the bells and whistles of the more expensive machines. But these promise a great espresso with no muss or fuss. In fact, most have enough features to more than satisfy your discerning tastes without being too overwhelming to master. Here are some of the top-rated espresso machines priced right around $200 that’ll put you aboard the express train to espresso elation! This one’s a little jewel in the DeLonghi family. It’s unique filter design lets you prepare single or double expressos in a single go. It also takes up very little counter space, and its light enough to move around from spot to spot. Operating it is pretty straight forward. Just fill the portafilter with your ground coffee, turn the dial on, and wait for the green light. Once you get the green light (literally and figuratively), turn the dial right. In a matter of minutes, you’ll have your prefect espresso ready and waiting for you. Pretty darn easy! Plus, clean-up is also a breeze, which isn’t always the case with espresso machines. The water tank and drip tray are removable and dishwasher safe. You can just dump the water, rinse the tray and you’re good to go! 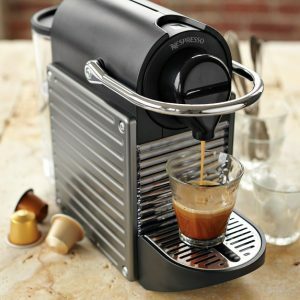 Get the DeLonghi EC3630 15-Bar-Pump Espresso Maker at Target.com. Be sure to save by using these Target coupons, promo codes and offers. This pick is both aesthetically pleasing and space saving, perfect for the minimalist or someone with a smaller kitchen. 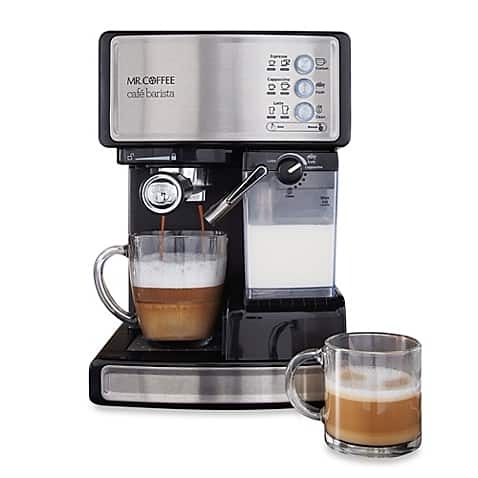 Even though it features both latte and cappuccino settings, it’s refreshingly simple to use. 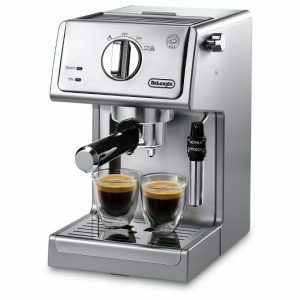 It comes with a one-touch control that lets you choose from a single or double shot of espresso, cappuccino or latte. Another cool feature is that the Mr. Coffee has an automatic milk frother that will let you select the froth level for a totally customized beverage. It even pours it into the cup for you! Yep, doesn’t get any easier than that! You can pick up this little treasure at the Mr. Coffee online store (mrcoffee.com). We also have some Mr. Coffee coupons, promo codes and offers to help you save. 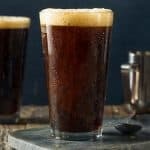 Some espresso purists might take issue with the fact that the Nespresso line uses pods in the place of fresh ground coffee beans. But, the convenience and easy clean-up make these machines a popular pick. This little number sports a modern, space-age chrome design, which is quite unique from the standard look of most other espresso machines. And don’t let the cutesy name fool you! Pixie might sound like a bit of a lightweight machine, but this Pixie packs a serious punch. It’s lightening quick, and super automatic. In fact, Nespresso’s little titan can heat water to proper brewing temps within 25 seconds, and it promises to brew your coffee in less than a minute. I want to note that the Pixie doesn’t come with a frother, but you can order a “bundled” version that includes their Aeroccino Plus Milk Frother for a slightly higher cost ($50 extra). Bottom line, if you’re looking for a more automated process that doesn’t involve grinding and extracting your own beans, the Nespresso Pixie is a perfect choice. Find the Nespresso Pixie and the Pixie with the Aeroccino Plus Milk Frother at Williams Sonoma. 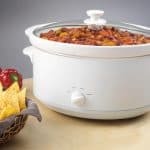 These machines are a bit more pricey than the others, so definitely use these Williams Sonoma coupons, offers and promo codes to save.